Classic hoop earrings with a contemporary twist. Creole earrings in smooth 9ct yellow gold featuring a stylish twist design, creating a distinctive appearance perfect for everyday wear. 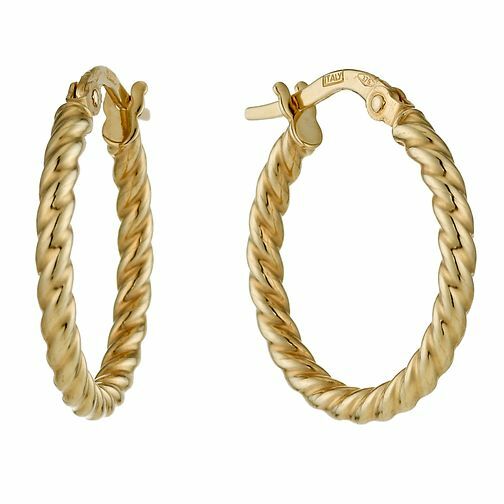 9ct Yellow Gold Twist Creole Hoop Earrings is rated 4.4 out of 5 by 5. Rated 5 out of 5 by Anonymous from This product is so elegant Bought these hoop earrings for myself with Christmas money I received.i am so happy with my purchase,perfect size ,beautiful design,I particularly like the clasp on the back,as they feel secure & it doesn't open to easily so I won't lose them.Thanks Samuels. Rated 4 out of 5 by Anonymous from Beautiful design I was looking for a pair of gold hooped earrings as a gift to my sister. She adored them, earrings arrived quickly and were as expected; the twist design is stunning, and is not usually something found on the market. Would recommend as a great gift for someone special or a gift to yourself.